Tourism Australia is launching a campaign in conjunction with Expedia Group Media Solutions that focuses on U.S.travelers. “An Australian Adventure,” which has just launched on expedia.com in the U.S., aims to leverage the momentum from Tourism Australia’s tongue-in-cheek Dundee Super Bowl commercial. It further positions Australia as a top destination for American travelers to help shift consideration among competitive destinations. “The Dundee teasers and the Super Bowl ad were all about grabbing America’s attention and creating a platform to capture the conversion opportunity for destination Australia,” says Lisa Ronson, chief marketing officer at Tourism Australia. Online travel agencies play a key part in the U.S. consumer’s travel journey, from research and planning through to booking, and Expedia Group has the largest share, she adds. “With their reach, distribution platform and ability to target, they have exactly the conversion tools we need to capitalize on Dundee and now translate the incredible awareness and interest we’ve generated into high-yielding holiday bookings,” Ranson says. 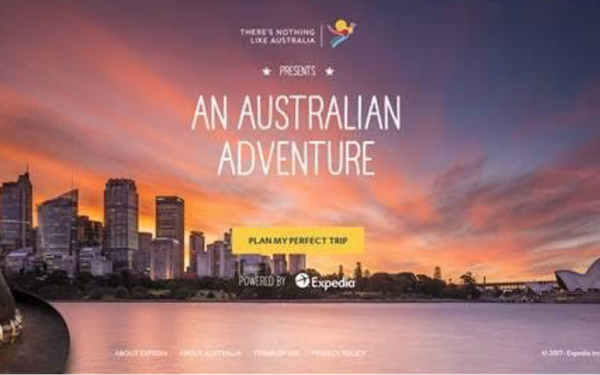 Developed for Tourism Australia by Expedia Group Media Solutions’ Creative Partnerships team, which acts as an in-house creative agency, the choose-your-own-travel-adventure style of campaign aims to help potential visitors plan and book their perfect trip to Australia. Four state partners, including Tourism Queensland, Northern Territory, Western Australia and Visit Victoria, are also participating in the campaign to increase Australia’s overall presence online. The campaign microsite features a mix of dynamic content, videos, imagery and information to showcase Australia’s unique landmarks and landscape, welcoming people, nature and wildlife as well as food and wine. Visitors to the microsite simply answer a few simple questions regarding trip duration, traveler type, ideal trip type and interests. They then receive a range of tailored destination recommendations and suggested itineraries for their trip to Australia, along with breath-taking video, imagery, tips and information – all designed to drive conversion.